Seventeen (17) Dial-A-Law scripts have been updated in October 2017. For a complete list of these resources, see their listing here (sorted by “last reviewed date”). Duty counsel is now available at the newest location of First Nations Court: Nicola Valley Indigenous Court (Merritt). This new booklet explains Gladue rights, rights under the Criminal Code that apply to anyone who identifies as Aboriginal. Gladue rights can apply at bail and sentencing hearings. New fact sheet about how to apply for welfare using your computer or mobile phone. Describes the three stages involved and the steps you follow at each stage. Expands on information printed in the booklet How to Apply for Welfare. Available in print and online. This booklet is now available in both traditional and simplified Chinese, French, Punjabi, and Spanish. Describes what abuse is, how to protect yourself and your children, what the courts can do, deciding parenting arrangements, and where to get help and support. Includes a checklist of what to take with you when you leave an abusive relationship. Questions and answers on wills and estates topics. Volunteer legal professionals provide answers to questions from the public relating to personal planning, wills, dealing with death, and settling an estate. This new online tool guides you through the steps of planning for a good life, including financial security, personal network building, estate planning, housing choices and supported decision-making. An informational poster to help explain the BC Provincial Court’s Support Person Guidelines. This updated booklet is for service providers assisting “mothers without status”. They are women who are neither Canadian citizens nor permanent residents. It gives an overview of the issues they face and options they can take. It includes information on where to get help. Amici Curiae is offering free one-hour sessions with legal professionals who can help you fill out your forms. Get help with forms for court, human rights, employment issues, residential tenancy, and more. No legal advice will be provided. Anyone can make an appointment by calling: 778.522.2839 or by email: aclegal.vpl@gmail.com. A system for healing for families going through separation and/or divorce. The goal is to improve access to mediation and other services, provide guidance, direction, and information to families in the Peace. The program works with the Registry and Court so when directed by the Judge or when families choose on their own, families will be provided more options for accessing alternative dispute resolution methods (mainly mediation through a roster of mediators working on a sliding scale). I think someone stole my personal information. What can I do? Gives you a selection of helpful guides when you suspect that you are a victim of identity theft. It also tells you who to call to report the incident and to ask for more information. Now includes links to Disability Alliance BC’s blog posts about the new increase to disability rates, the restoration of the bus pass program, and the new transportation supplement. Wills are essential tools for responsible planning and are applicable to persons considered “mentally capable” and 16 or older in BC. Completing a will is usually a relief. If you have been thinking about a will for yourself or if you have family members who have yet to take that step, the next few weeks are an excellent time to start. April 9-15, 2017 is Make-a-Will Week, and a number of organizations and legal professionals are coming together to donate their time and effort to help people write their will or bring an existing will up to date. A will doesn’t mean you’re totally covered — if you don’t know about Representation Agreements, Enduring Powers of Attorney and other personal planning documents, you’ll want to read more about these important legal planning documents with experts like Nidus Personal Planning Resource Centre and Registry. Make a Will Week is closely followed by Law Week, so there are a lot of events happening in the month of April. We covered a variety in our last post on April Events. 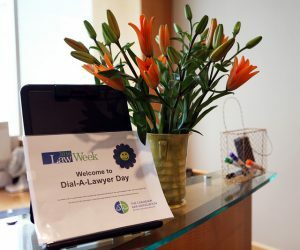 For example, the CBA BC is holding its province-wide Dial-a-Lawyer day on Saturday, April 22, 2017 from 10am – 2pm where anyone can call 604 687-3221 or 1-800-663-1919 for a free 15-minute consultation with a Wills and Estates Lawyer. They also cover other areas of law: Business, Employment, Family, Immigration and Tort & Motor Vehicle. Nidus is holding online and in-person presentations about Personal Planning — legal documents for health care, personal care, financial and legal matters. People’s Law School in collaboration with various organizations are holding many Public Legal Education Law Classes across BC on various topics, ranging from Writing a Will and Probating a Will to Strata Law. I want to learn more about making my will. What do I read? Who do I call? 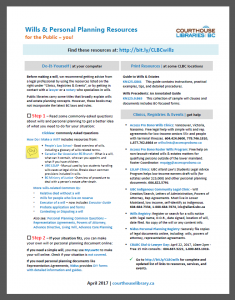 At the Wills and Personal Planning Resources page on the Courthouse Libraries BC website, there is a comprehensive list of free or nominal fee resources and services for everyone—from lawyers to people who aren’t familiar with the law. The webpage contains the full list of resources, services and events. The PDF handouts (printable, shareable) contain examples of types of help that can be found on the webpage, and contain a short bit.ly link that forwards to the webpage. If you would like to make a suggestion for a resource, please email us.